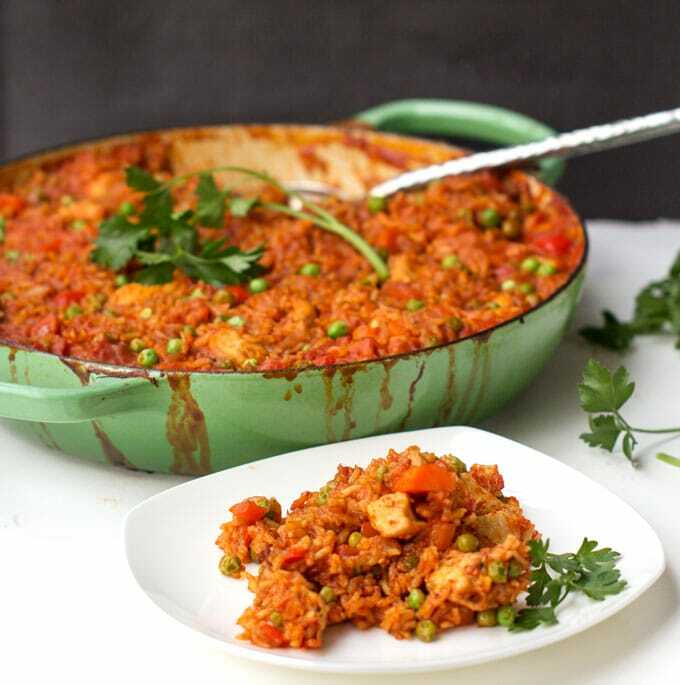 Jollof Rice is a popular West African chicken and rice casserole with lots of vegetables and a delicious tomato curry sauce. It’s a great dish for the whole family, full of interesting flavors yet mild enough to be pleasing even to those with more picky palates. Plus, all the magic happens in one pot! 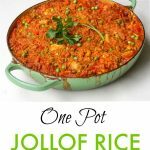 When Jollof rice first landed on our dinner table, my family had never tasted or even heard of Jollof rice before, yet it felt familiar. 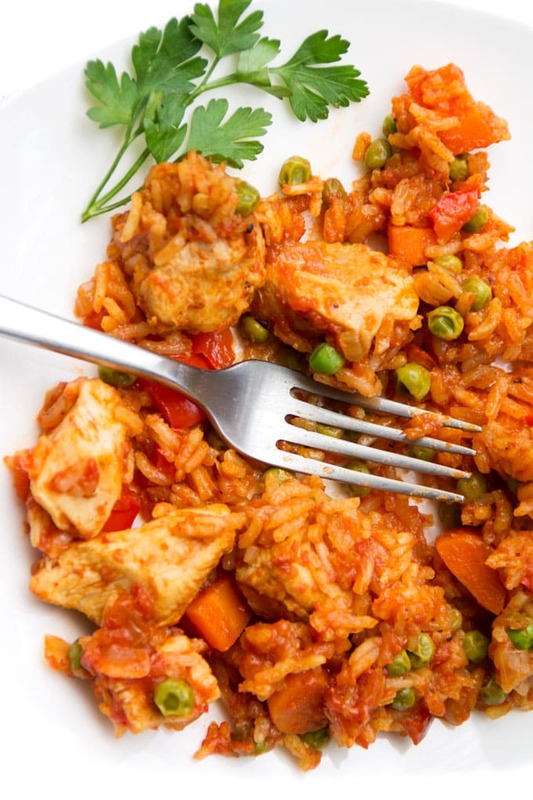 It’s that comforting, beloved one-pot chicken and rice dish that many of us are attracted to. There are lots of great casseroles like this across the globe, which is why I have a growing collection of these types of dishes here on Panning The Globe (see below). You’ll need a heavy pot or Dutch oven with a lid. To start, cut the boneless chicken breasts into bite-sized cubes and marinate them for ten minutes in a mixture of chopped ginger, garlic, salt and pepper. Next, lightly brown the chicken in batches. Set the chicken aside and use the same pot to sauté some garlic, ginger, bell peppers and carrots, which will create the flavor base for the curry sauce. Add curry powder and toast it a bit, stirring. Next add tomato paste, chicken broth and raw rice. Mix thoroughly so the rice is coated. Add the chicken back to the pot and pour in the rest of the broth and tomato puree. Cover and cook in a 350º oven for 20 minutes. Remove from the oven to add the peas. Then continue to cook for another 20-25 minutes. So many good things packed into one casserole! And having only pot to wash is a nice perk! I discovered Jollof Rice in The Ghana Cookbook which was gifted to me by Hippocrene Books. The Ghana Cookbook is one of those great cookbooks that makes you feel confident that you’ve found the utmost authority on authentic Ghanaian recipes. The book is a collaboration of two authors. Fran Osseo-Asare is an American woman who fell in love in love with a Ghanaian man in the late 1960’s, married him in the early ’70’s, became enamored with Ghanaian cuisine, and has since written several books on the subject. Co-author Barbara Baëta is a culinary star of Ghana. She has a Ghanian cooking school and a catering company and for decades she has cooked for Ghana’s foreign dignitaries and guests, including Barack Obama, to showcase the country’s cuisine. Here’s a proverb used to describe Ghanaian cuisine: “The good soup comes from the good earth,” meaning Ghana’s cooking tradition is to use fresh, locally sourced, seasonal ingredients. You really don’t need a side dish with Jollof rice. It’s a whole balanced meal with protein, carbs and veggies. But, if you have the time and inclination, I recommend a simple salad with a light citrusy dressing. It’s nice to have a cool crisp salad alongside a warm comforting casserole. Sautéed greens also goes really well on the side. If you’re interested in knowing more about the lovely green pot I used for this recipe, it’s The Le Crueset 5-quart Round Braiser.. It’s perfect for cooking this type of casserole, plus it looks great on the table, if you’re serving family-style. 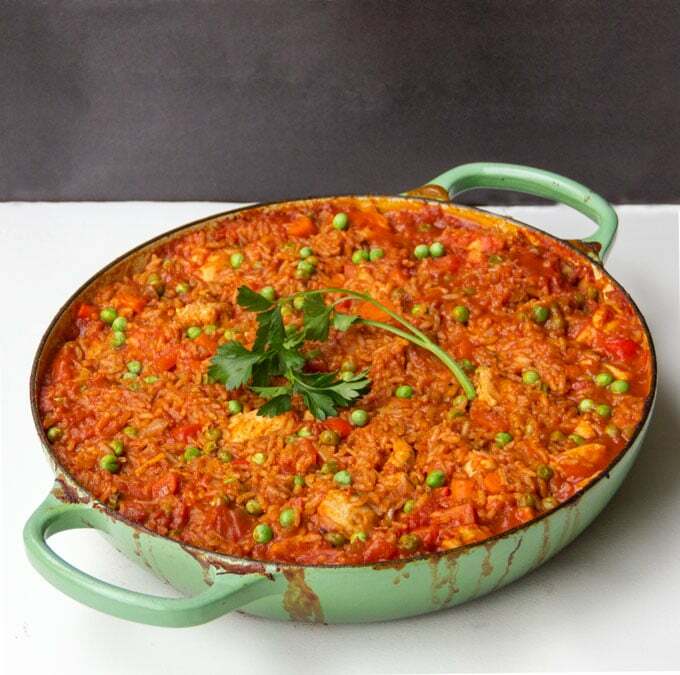 Here’s the recipe for Jollof Rice with Chicken. As always, I’m hoping you’ll cook this and then come back and leave a star rating and comment. I love to hear from you. Marinate the Chicken: In a large bowl, toss chicken with 1 teaspoon of the garlic, 1 teaspoon of the ginger, 1/2 teaspoon salt, 1/2 teaspoon Aleppo or crushed red pepper, and 1/2 teaspoon black pepper. Leave to marinate for 10 minutes. Brown the Chicken: Heat 2 tablespoons oil over medium high heat in a large heavy oven-ready pot or Dutch oven, with a lid. Add half the chicken and cook for about 3 minutes, tossing occasionally, until lightly browned but not cooked through. Transfer to a plate. Add 2 more tablespoons of oil to the pot and repeat with the rest of the chicken. Add the Rest of the Ingredients and Bake: Heat the remaining tablespoon of oil and add the rest of the garlic and ginger, the bell pepper, carrots and onion. Cook, stirring, for 3 minutes until slightly softened and fragrant. Add the curry powder and cook, stirring, for 30 seconds or so. Add tomato paste, 1 cup of chicken broth, the remaining 1 1/2 teaspoons salt and the bay leaf. Stir to combine. Add the raw rice and stir well so all the grains are coated. Add the chicken back to the pot, along with any accumulated juices. Stir to combine with the rice and veggies. Gently stir in the tomato puree and 2 cups of chicken broth. Bring to a boil. Turn off the heat. Cover the casserole bake in the oven for 20 minutes. Remove from oven, (leave the oven on) add peas and stir through. If rice looks dry, add another half cup of broth. Cover and return to the oven for 15-20 minutes longer, or until the rice is tender. Serve hot with a side of sautéed greens or a simple green salad. This post may contain affiliate links meaning that when you click on a link and make a purchase on Amazon, a small percentage is payed to Panning The Globe, at no cost to you. We’re deeply grateful for your support of this site. Recipe adapted from The Ghana Cookbook .The Ghana Cookbook was gifted to me by Hippocrene Books. All opinions are my own, always. looks like South Korean food. What a great weeknight dinner. I’ve heard of jollof rice, but never knew exactly how it was made. 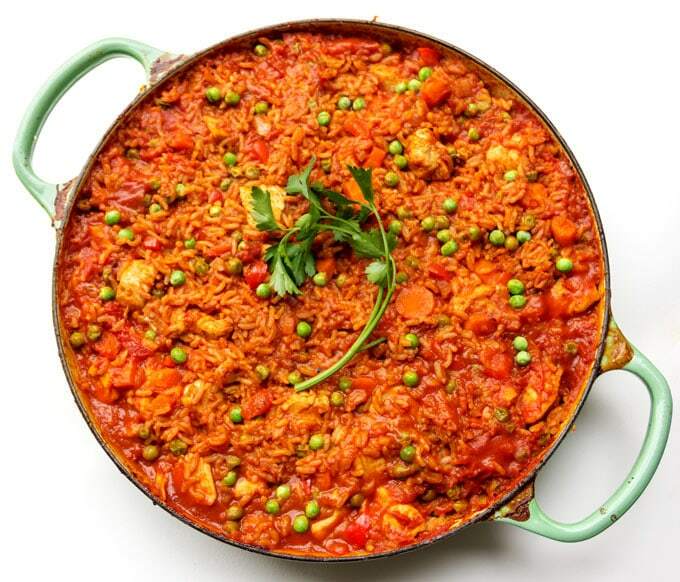 It sort of reminds me of arroz con pollo – when rice is baked with chicken and spices, it takes on such a lovely texture and taste. Thanks for opening my eyes to Ghanaian cuisine. Sounds like I should investigate it further. I made this tonight and it was delicious! Everyone loved it… We always love the recipes from your blog! Hi Lisa, what a great dish. I love learning about different cultures and cuisines, and am never disappointed when I visit your site. What a great cookbook and I loved learning about the authors. I love anything with rice, this looks like the perfect meal for me. Thanks for sharing!